You might vacation, you might have extended family meals and you might have friends hosting house parties. Enjoy them all and keep these five pointers in mind. Not thinking about your job search during the holidays could be the best thing for your job search after the holidays. 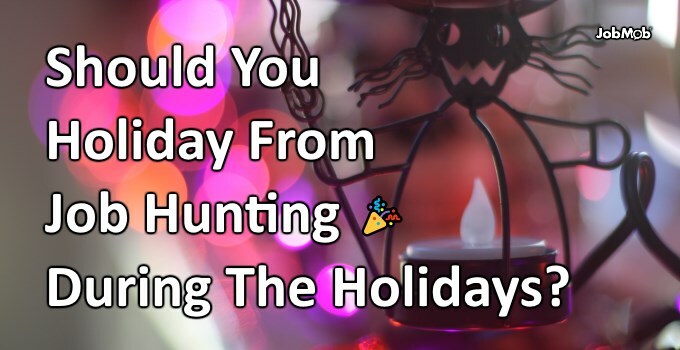 In your experience, is job search easier or harder during the holidays? … from your computer screen, job boards, email, application forms, LinkedIn messages to congratulate other people on their new jobs, cover letters, work portfolios, job fairs, followups, references, background checks, networking events, interview preparations, graphology tests, recruiters, job search blogs (ahem) and everything else related to your next paycheck. One of the reasons people are ashamed to admit they’re job hunting (during the holidays or at all) is because they don’t have good answers to that question, so when they hem and haw, it sounds like they’re not progressing or even sure what to do next. Do you find job hunting during the holidays easier or harder? Tell us in the comments. Subscribe to JobMob via RSS or email and follow me on Twitter for more ways to enjoy the best times of year even when job seeking. Business cards are a good idea but I would suggest to spend a few extra dollars to get a quality card. I know $ are often tight for people who are job searching but it doesn’t cost a lot to upgrade the quality of the card. Another suggestion I would add is to follow up with a professional / personalized follow-up/Thank You card. I use Pixingo (ask me if you want to know more) but sendoutcards is another option. For about a $1 you’ll stand out and make a lasting impression.